Halloween is definitely the scariest of the major holidays, but reading some of the ridiculous myths out there about our favorite holiday might even be scarier. Yes, even the creepiest of witch, ghoul and Jason costumes don’t come as close to freaking us out as much as these urban legends surrounding Halloween do. While Halloween may have recently passed (to our dismay, but at least we have time to get our pumpkin farm ready for next October! ), fall is still here and Thanksgiving is fast approaching. Due to our love of all of the autumn seasonal festivities, the team at Bengtson’s Pumpkin Fest is always open to discussing things related to this special time of year. In another blog post about Halloween, we’re going to take a look at these myths that would scare the likes of the most terrifying monsters in history. We’re already getting ramped up for next season’s local pumpkin patch here in Homer Glen, and we want to share our excitement with you! Stay updated with what’s going on at our Illinois pumpkin patch here at our blog, or feel free to reach out to us with any questions. This is an extremely popular Halloween myth, but it is absolutely untrue – people simply don’t poison candy. We don’t want to come across as naive and overly trustworthy, but the only known case of poisoned Halloween candy occurred back in 1974. Reported incidents are usually hoaxes called in by meddling kids looking to be entertained, especially in this day and age. It’s incredibly easy to stick something in your own candy, take a picture with your phone, and post it on social media. We’re not sure why people seem to be so bent on believing that everyone is out to poison your kid’s candy. If you’re a concerned parent, just make sure that what your kids are eating is candy that’s properly wrapped and sealed – don’t take caramel apples or other unwrapped treats from strangers. Though we’re not exactly sure where the superstition around black cats originated from, you’ll be just fine leaving black cats alone. If you own a black cat, they’re not going to be in any danger of being killed or sacrificed in some strange way. If innocent pets and animals somehow become the victim of horrendous pranks or torture, that is due to the psychopathic individuals that inflict harm on these poor animals, not some superstition surrounding Halloween. 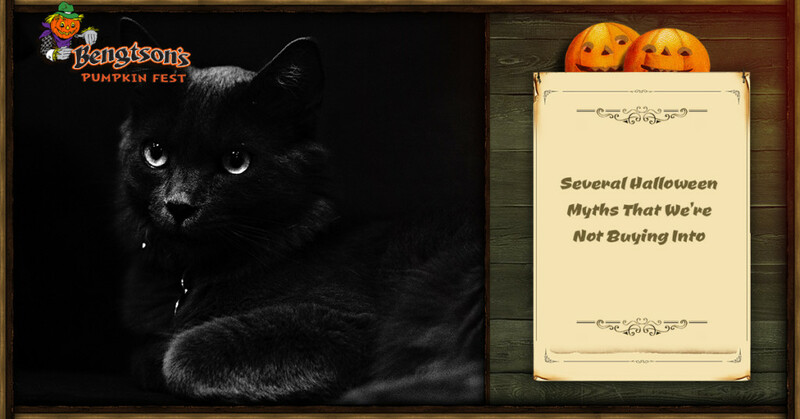 Even the American Society for the Prevention of Cruelty to Animals (ASPCA) says that “while it is true that animals too often become the victims of holiday pranks and cruelty, there is no reason to believe that witches are involved.” So, take it easy knowing that your adorable pet black cat is going to be just fine around Halloween. When you look into the history of this sugar-fueled and costume-driven October holiday, what you’ll learn is that Halloween is best understood as a product of 18th-century folklore traditions of Scotland and Ireland. Halloween’s strongest roots actually sprout from Catholic traditions – quite the opposite of Satanism. The name ‘Halloween’ is actually derived from All Hallow’s Eve, which is the evening before All Saint’s Day (the more you know!). So instead of worrying about Satan’s presence during this fun and festive holiday, relax, dress up, eat a candy bar, and have some fun. While it’s pretty fair to say that America formed Halloween into what we know and love today as dressing up in costumes and carving Jack-O-Lanterns, the origins of this holiday do not lie in the United States. The origins of Halloween can actually be traced back to a pre-Christian Celtic festival known as Samhain – for the Celts, the first of November marked the end of the harvest and the beginning of the new year. The Celts believed that the souls of the dead mingled among the living at the time. So, they associated the fruits of the harvest with death, afterlife and the supernatural. Fast forward several years and later, Saint Patrick and other missionaries converted Ireland to Christianity. Then, November 1st become known as All Saint’s Day, or All Hallows Day, as we mentioned above. The eve of All Hallows become known as Halloween, including feats, the blessing of the hearth, and lighting candles and bonfires to welcome wandering souls. This still remains a family celebration in Ireland. Very few early American settlers actually observed Halloween, in fact – it wasn’t popularized until Irish immigrants in the 19th century brought over many Halloween customs to the United States. For Bengtson’s, It’s Autumn Year-Round! While the seasons change around the world, our heart continually lies in pumpkin production and all things related to this magical time of year. With Thanksgiving coming up, it’s still a great time to use pumpkins for decorations and, of course, pumpkin pie! Stay up to date with what’s going on at our Illinois pumpkin fest and pumpkin patch farm here.